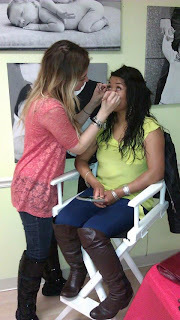 Last night I went to the Mingling Moms event put on by Rhody Mamas at Bellani Maternity. So much fun! It was nice to run into so many friends standing outside already when I arrived. Can you see me? 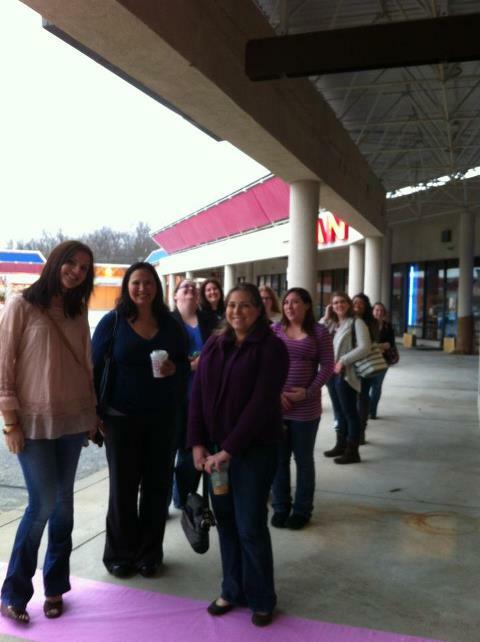 I'm all the way on the left in the black, about four girls back. We walked in on an adorable pink carpet and checked in. Awesome goody bag too for registering early! Y'all know how much I love my swag! Stila Lip Glaze, a gift card to the Savory Grape (because I love wine even more! 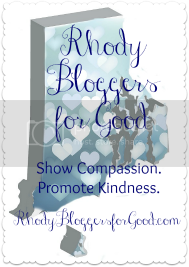 ), Old Navy bucks, a Kayleigh's Klippie and more! My girls and I made our first stop at the Savory Grape wine and Yacht Club soda table. Mmmm Merlot. So.good! Having learned about lines from Getting Gorgeous, I saw the empty seat at the Stila table from Studio B and hopped right in! I got an awesome makeover. Loved the liquid foundation with the bronzer in it - SPF included by the way! And my eyes! Kicking myself for not getting a photo after it was all done. Everyone complimented me on my eyes after that. 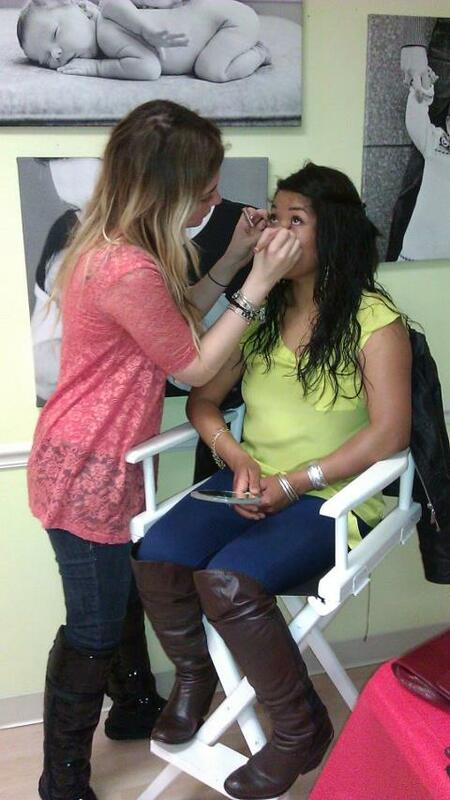 Here's Carla getting hers done. The Kayleigh's Klippies table made me wish I had little girls in the house. Tutu's, hair clips and more. So adorable. No words. 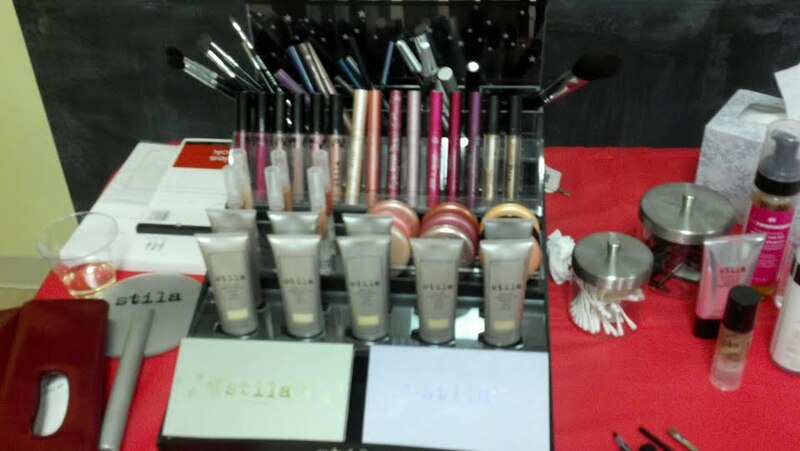 Bellani had some great sales going on as well! Finally met Joanna and Kristen in person which was so nice! And Sarah, Shannon, Carla and I spent awhile talking in between raffles. That's right, I said raffles. Lots of prizes were given away between the shopping. I won the only item I already own - and happen to love. I got my first School Years from momAgenda at Style School. After that I was so in love that I recently ordered two more from Zulily, so I have one for all 3 boys. I may have been terrible at baby books and photo albums for them as I sort of live life digitally and without scrapbooks. This though? I can rock for them. From the momAgenda website, School Years is: a convenient portfolio that helps you organize important mementos from pre-K to 12th grade, like report cards, school pictures, and writing and artwork samples. Perfect! The Big Guy's is in sage and the twins are both in aqua. And I am giving away the one I won last night in aqua, because I love my readers! Big thanks to Rhody Mamas and Bellani for such a fun girls night, and the use of their photos. So what are you waiting for? Go enter to win! Great to see you and spend some time catching up, Liza!